Are you getting tired of changing the litter box each time? Or do you dislike the smell of freshly baked catpoo? Well, this might just be the solution for you and your cat. I found this gem on Imgur. 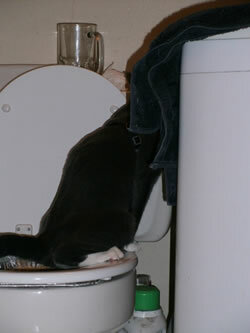 I’ve turned this into a step-by-step guide on how to potty-train your cat. Place a bowl of some kind below your toilet seat. A empty lasagna bowl was used in the picture, but you can use whatever you have laying around, as long as it fits. Fill the bowl with your regular litter box filling. Also place your current litter box next to the toilet. 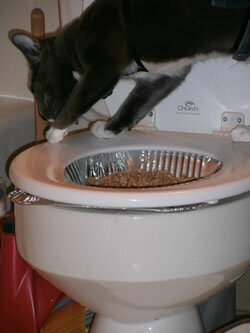 Put some of your cat’s droppings (yes I mean cat poo) in the bowl. This way the cat will pick up the scent and know this is a safe place to go to the toilet. 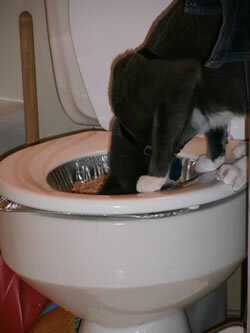 If your cat gets on the regular litter box, move him to the toilet seat. Do not force your cat, this will have a negative effect and your cat will dislike the toilet seat. 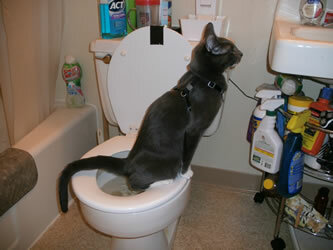 Just gently place the cat on the seat and let it see whether or not it wants to use the toilet-litter-bowl or not. If at first you don’t succeed, try it the next time your cat needs to do no.2. Eventually your cat should get the idea. Finally, remove the bowl from below the toilet seat entirely. Your cat should be adjusted by now. 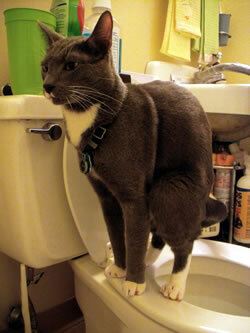 With a bit of luck, your cat can now use the toilet like any other human. Remember, this might not work for all cats.